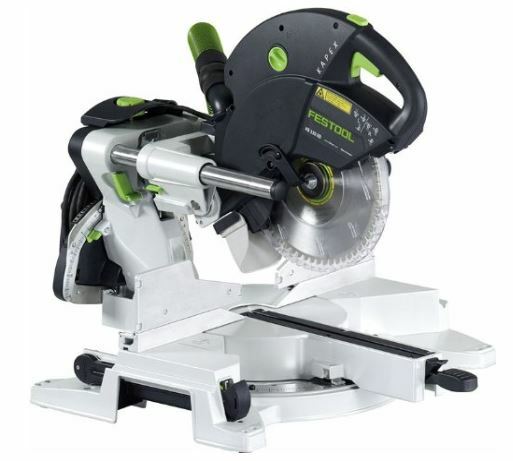 5 Best Compound Miter Saw Reviews – Which One Should You Buy? Compound Miter saws perform the difficult task of combining vertical and horizontal angles in a single cut. The blade drops down on the wood or other material to make a precise cut; the action can be that straight, angled, or beveled. These tools cut the miter angle from zero to 90 degrees; they cut vertical angles or bevels from zero to 45 degrees with some models going as far as 52 degrees. 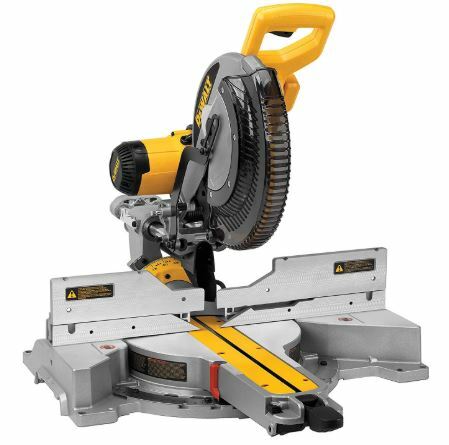 The compound miter saw review must consider the many uses of this versatile power tool. 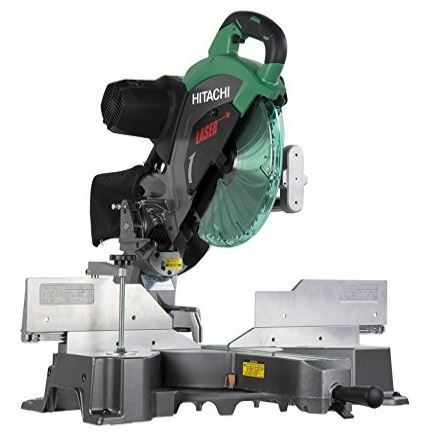 It can replace a wide range of power and hand tools with quick, exact, and repeatable cuts. 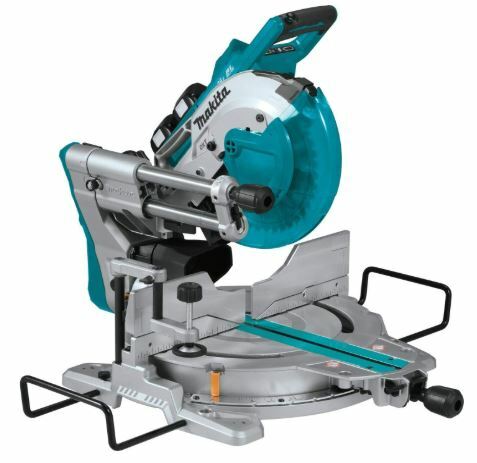 This powerful machine Makita XSL06PT runs on two 18-volt Lithium-Ion batteries. It has the power to burn through hardwoods and dimensional lumber. The solid metal frame and construction give the machine a substantial feeling. The sliding blade arm operates smoothly, and the machine runs quietly with little sound and vibration during cuts. This machine has versatility, and features of a top power model without the cord. The miter settings are precise with stops at the standard angles. The laser helps get precision cuts right, and you can easily repeat them as needed. Battery runtime measures in several hundred cuts before needing a recharge. You can keep a spare set of batteries in the charger for continuous operation. You should buy a compound saw if you want to cut wood and other material with precise and repeatable strokes. The compound miter lets you lift and drop the blade to produce straight lines, angles, and bevels that will be exact. They will fit perfectly into the spaces they must go. You can buy a single bevel, or double bevel model. The difference being that single bevel saws will require that the user turn the material over to make a second bevel in the opposite direction. The difference in price may make the light users balance the cost versus the convenience. The double bevel with a sliding blade offers the ultimate in flexibility, precision, and convenience. With the right blades, you can cut high volumes of wood, and you can make clean and precise cuts. The compound saw handles molding up to the height limit of the fencing. Although designed primarily for wood, compound models can cut composites, plastics, and metals. The compound saw is an excellent buy for users with all levels of experience with power tools. For hobbyists, woodworkers, and professionals, it is a reliable part of getting the job done. This powerful saw has a 15-amp motor operating at 120 V. It produces a 4800-rpm blade speed with no load. This machine has essential safety features including an electric brake to stop the spinning blade quickly. The contoured grip is soft and comfortable. It absorbs vibration and provides all-day run without stress on the hands and wrist. The Axial Glide system replaces the usual rails for the sliding blade. The system uses an articulated arm instead. The arm provides better stability and accuracy during cuts than the old rail system did. This is particularly important for clean and precise crosscuts. This powerful cutting tool handles 12-inch stock, 5.5 in tall base trim, and 6-inch crown molding. The machine has dual bevels and can cut on two sides without having to stop the process to turn the stock. The left and right side bevel cut ranges are zero to 47 degrees. The front location of the bevel selector is convenient for seeing the angle and making changes with a single lever. The meter settings have standard detents for quick adjustments. You can move to a setting then override it with a push-button control to get a fine adjustment. The detent override saves time by getting to the fixed setting quickly and then making a fine adjustment to the exact setting you need. Dust collection system is the best in the class. It rates for a 90 percent capture of sawdust and debris. This feature saves time during clean up and can work with a collection bag as well as a shop vacuum. The Fast Efficient Safe Tool power saw lives up to its name and fits in the tradition of high-value power tools from this manufacturer. It begins with a compact design that features forward rail carriage for the sliding blade. This feature saves nearly a foot of room on the back side of the machine and gives it an amazingly small footprint. The rails carry the blade securely, silently, and precisely over the path of the cut. The machine is lightweight, strong, and portable. Despite the abundance of features and metal construction, it only weighs 47 lbs. It uses a fine blade, and this system has dramatic results. The kerf is small, the cuts are clean, and there is very little noise or vibration. Blade changes are safer because the special spindle wrench locks the trigger automatically to prevent accidental starts while changing blades. The fine blade also works with the special cutting position. This technique uses the back of the blade to extend the size of the cut. For example, with this position, the vertical limit is 4.75 x .75 inches, and the crown molding height is 6-5/8. The dual lasers add a layer of precision to cuts of every type. The lasers adjust easily with three axial control knobs for precision settings. Once set, the lasers show the material to be removed in the cut. The lasers run on electric circuits and not on batteries like many competitor machines. The power comes from a 1600-watt direct drive motor that spins the blade at controlled speeds up to 3400 rpm. The Variable Speed Control keeps a constant blade speed on any application. It works harder when cutting hardwood or tough material. The soft start feature avoids sudden surges at startup. This model is a powerhouse; and has many advances in power tool innovation. You can choose the corded or cordless operation. 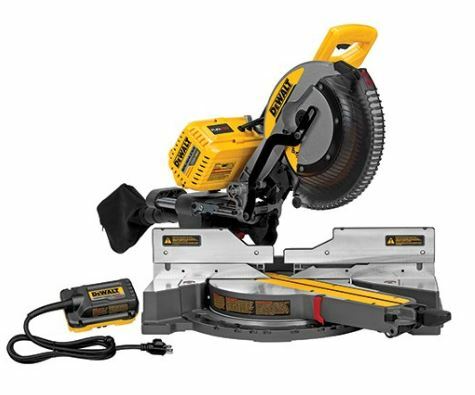 You can run it as a corded saw with an unlimited power supply; when needed, you can use the powerful set of batteries to do the same work. On battery power, it has the cutting power and features found on the top-rated corded models. The double battery power provides a long runtime that will let you start and finish many jobs on a single charge. The Flexvolt system permits the owner to use the power pack with other DEWALT products that use the same or lesser amounts of charge. The 120v brushless motor runs cooler and more efficiently than brush models, and this efficiency extends the battery output per charge. The motor churns out 3,800 rpm with no load; this is a high level of output that will let the blade slice through tough wood and materials. The cutline system has markers to guide the alignment of the blade to the target area. The user never has to guess at the landing spot for the blade or the material that it will remove. The bevel and miter settings are simple and straightforward; adjustments from the standard detent settings make it easier to get to customized miter angles quickly. You can adjust the plate to re-set the detents. This machine is strong, solidly built and composed nearly completely of metal. It weighs only 56 lbs. and it portable for use where needed including areas without electric service. The dust collection system is efficient and will reduce the amount of clean up after usage. The well-built machine has a solid design, metal construction, and a powerful 15 Amp motor. The direct drive motor delivers a blade spin rate of 3600 rpm. The DWS780 has precision-machined parts, fences, and bevel system. The stainless steel miter plate resists damage. Cross cuts can be precise and repeatable with the XPS alignment system. The bright LED puts a shadow along the cutline for the blade position. The shadow shows exactly where the blade will touch the material. This is more accurate than a laser, and it does not need batteries like many models. The XPS alignment does not change over time or with usage, and it does not need a reset after a blade change. You get precision cuts without having to recalibrate. The DWS780 is an industry leader in cut capacities. The miter range is 0 to 60 degrees left, 0 to 50 degrees on the right; it can bevel equally well with 0 to 48 degree left and right. The crosscuts 2 x 14 stock at 90-degree angle, and it miter cuts up to 2 x 10 boards at a 45-degree angle. For cutting baseboard type stock, the capacity is 6.5 inches left and right with a crown molding height capacity of 6-5/8 inches. The DWS780 is easy to use. The dual bevel system has a high visibility scale and easy adjustments for the miter angles. Visibility is important when working under various light conditions. The DWS offers trouble-free operations. The dual bevel system is easy to see and use in job site conditions thanks to its high-visibility scale and easy angle adjustment. The miter plate adjusts easily too. The plate has ten positive stops. You can press the cam button to lock out the angles in between the detents. You can also override the detents so that you can make adjustments without getting caught in the detent spaces. The powerful motor turns the blade at 4000 rpm or more. The fixed rail system carries the blade over the stock for cross cutting. This is the zero-clearance function, and you can place the machine near walls and other objects. The rails are fixed in place, and this saves space in the rear of the machine; there is no need for extra room for clearance for the movement of standard rails. The preset stops are solid and lock in with no play. This gives consistent, accurate cuts. Many improvement and woodworker projects require precise cuts and tight-fitting joints; it will deliver. The laser marker shines a light across the entire surface for cutting. You can adjust the width of the laser marker. It can be as wide as the saw blade and wider up to a maximum width. The adjustable laser marker can help when you have to cut inside or outside of a line; the marker can guide when you have to account for the kerf. The dual bevel angles on the left and right-side permit continuous work without lifting the stock and turning it over. The machine provides up to 45 degrees of tilt on the left or right side. The miter has positive stops that help get you to the standard angles. You can make adjustments off the standard stops and quickly achieve a custom setting. The settings lock easily into place with a lever for one-handed operation. At 59 lbs., the machine is easily portable and requires only 115-volt house current. The cordless compound model from Makita will handle the main types of work these tools do in framing, trim, cutting angles and bevels. The fine controls and precision setting will help with fine and detail work too. 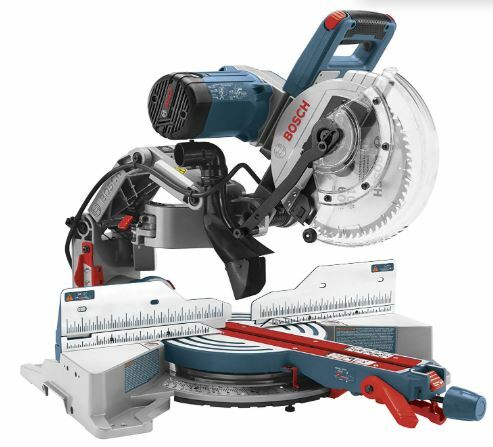 It may be an investment for the homeowners and hobbyist, but it is a worthwhile investment (like other Miter Saws) that will pay dividends in high-quality performance for many years of usage. The Hitachi line of products emphasizes quality and innovation. They have advanced the art of precision cutting with the articulated arm and other features like the laser marker. The price point is dramatically lower than the high-end models in this review, but you will get the value for your dollar with many seasons of production. Return to our homepage at the following url: www.bestcabinettablesaws.com.